Gliding is the most beautiful and absorbing way of flying. Even a first short flight can be a memorable experience, and gliding’s challenges and delights continue to enthral the most experienced pilots. While most flights are made within safe reach of the home field, it is possible to soar higher than the Alps for many miles across country, using only the hidden energy in the air and hardly noticed from the ground. Your first flight may seem remarkable, but your first solo or cross country will be every bit as exciting and very much more rewarding. These will be real achievements, gained by applying new skills and knowledge. 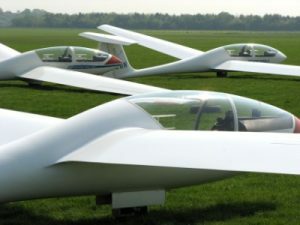 Although gliding is very much concerned with personal achievement it is far from a solitary sport as each pilot is very dependent on other enthusiasts. You will be expected to help others just as they help you through activities such as running the field, driving the winch, launching gliders and maintaining equipment. The club was formed at Meir Airfield in 1962 and moved to a moorland site near Leek when Meir closed in 1972. We moved to Seighford in 1992 as it is much more suitable for modern gliding. Since the move we have grown to around 120 members. We are a self help club without any employees, which keeps down the cost of flying and encourages a friendly atmosphere sometimes lacking in the larger professional clubs. The club fleet includes three two-seat training aircraft and two single seat gliders. 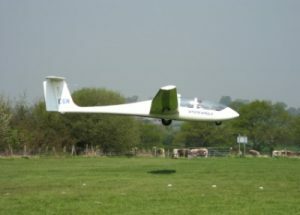 In addition to the club fleet there are many privately owned gliders based at Seighford. Gliding at Seighford takes place every weekend and bank holiday throughout the year and on Wednesdays during the summer (May to August). In addition short courses and expeditions to other sites are arranged from time to time. It needs a team to prepare the gliders and equipment before flying and to put them away at the end of the day. Therefore members are encouraged to spend most of each day on the site and flying is normally organised in the order of arrival. The club is registered as a company belonging to the members who elect an Executive Committee at Annual General Meetings. It is non profit making and all the revenue is used to meet operational costs and to fund new developments.